When you Save an Excel 97-2003 file(xls) that you have open in Excel 2007-2013 or use Save As to save an Excel file that is open in Excel 2007-2013 as Excel 97-2003 file (xls) it is possible that the Compatibility Checker dialog pops up. Note: You only see this dialog if there are features in the workbook that are not supported in Excel 97-2003. The Compatibility Checker scans your workbook for Compatibility issues and displays warnings if they can be found in your workbook. These features may be lost or degraded when you continue to save the workbook in the Excel 97-2003 format. in this workbook. Table style formatting cannot be displayed in earlier versions of Excel. Now you have information about the compatibility issues that are present in the workbook you can make a decision what to do, Save as Excel 97-2003 file or not. Like it says "Minor", most likely it is no problem to save the file as Excel 97-2003 file and share it with an Excel 97-2003 user. You can uncheck the checkbox named "Check compatibility when saving this workbook" if you not want to let the Compatibility Checker check your workbook anymore when you save the file. When you have Issues in this section continue saving the workbook is most of the time not a good option because you will lose data/formulas or specific things will not work correctly anymore. And not use columns/rows with data outside 256(IV) columns by 65536 rows. These are just two examples of issues that you can have. So looking for a workaround is maybe an option for you. If you only want to show the data in your workbook to an Excel 97-2003 user there are two options. 2: Send your workbook in the Excel 2007-2010 format to the Excel 97-2003 user. And let the Excel 97-2003 user install the Excel Viewer. You can also download the Microsoft Office Compatibility Pack at the Microsoft site, with this Microsoft Office Compatibility Pack you can Open/Edit/Save files that are in the 2007-2013 format in older Excel versions, but it will not for example display columns/rows with data outside 256(IV) columns by 65536 rows. Also when there are formulas in the workbook that are new in 2007-2013 they will display a #NAME error when you recalculate the workbook. You see that the Viewer or saving as PDF is a better option if you want to show Excel 97-2003 users the data in your 2007-2013 workbook. 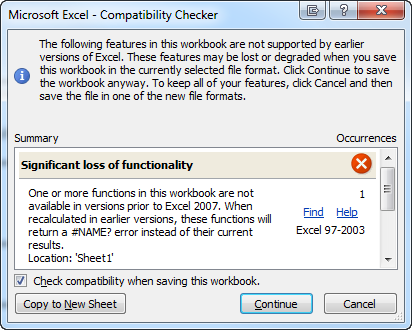 You can use the macro below in your 2007-2013 workbook to create an Excel 97-2003 workbook of the active sheet and avoid the CheckCompatibility dialog to popup. Be sure that there are minor or no compatibility issues when you use this macro. Be sure that there are minor or no compatibility issues when you use this macro. Kill TempFilePath & TempFileName & ".xls"